Public community Mobile Ad Hoc NETworks (MANETs), such as the “Funkfeuer” or “Freifunk” networks, scale up to several hundreds of routers, connecting users with each other, and with the Internet. As MANETs are typically operated over wireless channels (e.g. WiFi), access to these networks is granted to anyone in the radio range of another router in the MANET, and running the same MANET routing protocol. In order to protect the stability of the networks from malicious intruders, it is important to ensure that only trusted peers are admitted to participate in the control message exchange, and to provide means for logically “disconnecting” a non-trustworthy peer. This paper presents the concept of admittance control for the Optimized Link State Routing Protocol version 2 (OLSRv2), and suggests a security extension based on digital signatures. Due to the flexible message format of OLSRv2, this extension keeps compatibility with the core OLSRv2 specification. 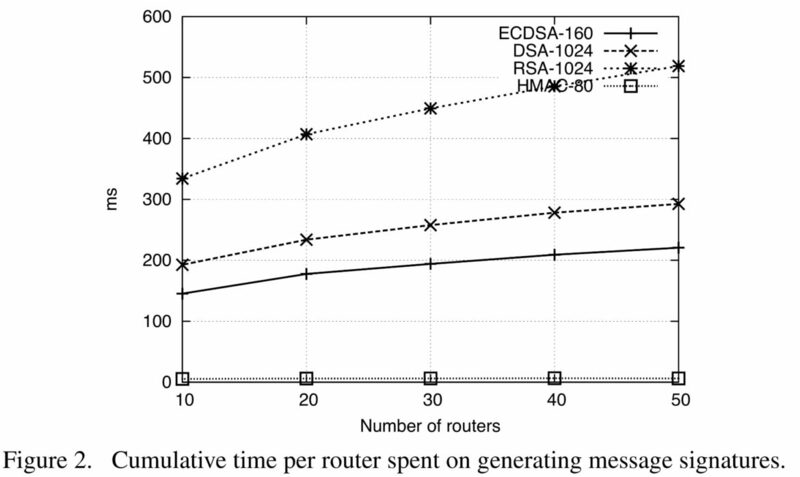 Several standard digital signature algorithms (RSA, DSA, ECDSA), as well as HMAC, are compared in terms of message overhead and CPU time for generating and processing signatures.